Cameras aboard planes can track robberies in progress and provide a wealth of data for tracking criminals. DAYTON, Ohio — Shooter and victim were just a pair of pixels, dark specks on a gray streetscape. Hair color, bullet wounds, even the weapon were not visible in the series of pictures taken from an airplane flying two miles above. But what the images revealed — to a degree impossible just a few years ago — was location, mapped over time. Second by second, they showed a gang assembling, blocking off access points, sending the shooter to meet his target and taking flight after the body hit the pavement. When the report reached police, it included a picture of the blue stucco building into which the killer ultimately retreated, at last beyond the view of the powerful camera overhead. As Americans have grown increasingly comfortable with traditional surveillance cameras, a new, far more powerful generation is being quietly deployed that can track every vehicle and person across an area the size of a small city, for several hours at a time. Though these cameras can’t read license plates or see faces, they provide such a wealth of data that police, businesses, even private individuals can use them to help identify people and track their movements. Already, the cameras have been flown above major public events, such as the Ohio political rally where Sen. John McCain, R-Ariz., named Sarah Palin as his running mate in 2008, McNutt said. They’ve been flown above Baltimore; Philadelphia; Compton, Calif.; and Dayton in demonstrations for police. They’ve also been used for traffic impact studies, for security at NASCAR races — and at the request of a Mexican politician, who commissioned the flights over Ciudad Juarez. Defense contractors are developing similar technology for the military, but its potential for civilian use is raising novel civil-liberty concerns. In Dayton, where Persistent Surveillance Systems is based, city officials balked last year when police considered paying for 200 hours of flights, in part because of privacy complaints. McNutt, a retired Air Force officer who once helped design a similar system for the skies above Fallujah, a key battleground city in Iraq, hopes to win over officials in Dayton and elsewhere by convincing them that cameras mounted on fixed-wing aircraft can provide far more useful intelligence than police helicopters do, for less money. The Supreme Court generally has given wide latitude to police using aerial surveillance so long as the photography captures images visible to the naked eye. 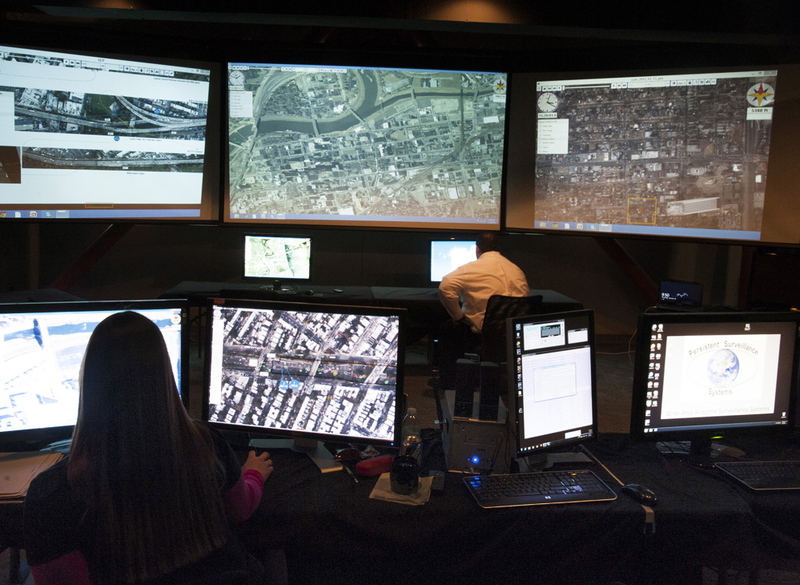 What McNutt is trying to sell is not merely the latest techno-wizardry for police. He envisions such steep drops in crime that they will bring substantial side effects, including rising property values, better schools, increased development and, eventually, lower incarceration rates as the reality of long-term overhead surveillance deters those tempted to commit crimes. Dayton Police Chief Richard Biehl, a supporter of McNutt’s efforts, has even proposed inviting the public to visit the operations center, to get a glimpse of the technology in action. It has rules on how long data can be kept, when images can be accessed and by whom. Police are supposed to begin looking at the pictures only after a crime has been reported. Pure fishing expeditions are prohibited. The technology has inherent limitations as well. From the airborne cameras, each person appears as a single pixel indistinguishable from any other person. What they are doing — even whether they are clothed or not — is impossible to see. As camera technology improves, McNutt said he intends to increase their range, not the precision of the imagery, so that larger areas can be monitored. The notion that McNutt and his roughly 40 employees are peeping Toms clearly rankles. Yet in a world of increasingly pervasive surveillance, location and identity are becoming all but inextricable — one quickly leads to the other for those with the right tools. By reviewing the images, frame by frame, analysts were able to help police piece together a larger story: The man had left a residential neighborhood at midday, attempted to rob the bookstore but fled when somebody hit an alarm. Then he drove to Subway, where the owner pulled a gun and chased him off. His next stop was a Family Dollar Store, where the man paused for several minutes. He soon returned home, after a short stop at a gas station where a video camera captured an image of his face. On another occasion, Dayton police got a report of a burglary in progress. The aerial cameras spotted a white truck driving away from the scene. Police stopped the driver before he got home from the heist, with the stolen goods sitting in the back of the truck. A witness identified him soon after. In addition to normal cameras, the planes can carry infrared sensors that permit analysts to track people, vehicles or wildlife at night — even through foliage and into some structures, such as tents. Courts have put stricter limits on technology that can see things not visible to the naked eye, ruling that they can amount to unconstitutional searches when conducted without a warrant. But the lines remain fuzzy as courts struggle to apply old precedents — from a single overflight carrying an officer armed with nothing stronger than a telephoto lens, for example — to the rapidly advancing technology. “If you turn your country into a totalitarian surveillance state, there’s always some wrongdoing you can prevent,” said Jay Stanley, a privacy expert with the American Civil Liberties Union.